Our company has created niche in the field of offering GI Decking Sheets to the clients. GI Decking Sheets are designed under the supervision of experienced professionals in line with the quality standards set by the industry. Offered range is stringently checked on numerous parameters in order to supply best quality range at customer’s premises. 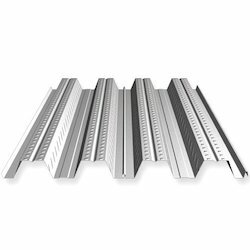 GI Decking Sheets are appreciated for nice appearance, flexible nature and corrosion proof manufacturing technique. These products have thoroughly checked flawless nature by different parameters before their delivery in the market. Taking quality as our prime concern, we have gained a respectable position as a supplier and trader of Deck Sheets. GI make Decking Sheets with deeper crest and pitch for strength and weight bearing feature. Mostly used in building multi-story sheds and also these days in commercial and portable structures. Available in all thickness starting 0.80mm up to 1.80mm on order.